Can Tho (VNA) – APEC officials have applauded Vietnam’s hosting of the Food Security Week, which took place in the Mekong Delta city of Can Tho from August 18-25, as well as initiatives the country raised at different discussions during the week. Pavel Krasilnikov, Deputy Director of the Eurasian Centre for Food Security of Moscow State University, said Vietnam’s organisation of the Food Security Week is very good in all stages, from accommodations for delegates to transportation and especially security. “I was impressed when attending the sessions because all of them were very well arranged, signaling professional preparations,” he said. Vietnam’s proposals during the Food Security Week are very timely, he said, noting that globally, there are certain concerns about impacts of agriculture on the environment. That’s why developing green agriculture, as suggested by Vietnam, is very important. Pavel Krasilnikov said he also had interesting experiences when travelling several local destinations. “It is important to understand about the life of normal people before speaking about food security,” he added. 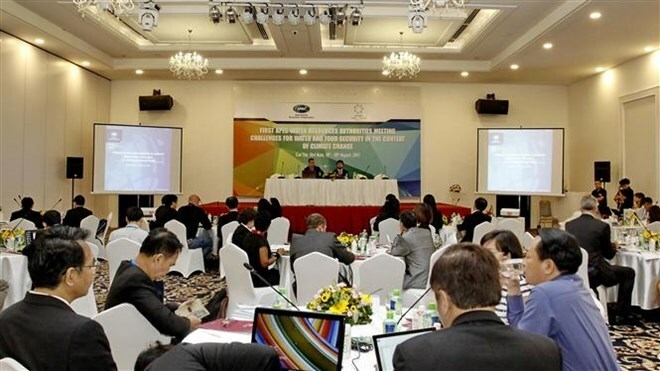 Patrick Moran, Lead Shepherd of the APEC Oceans and Fisheries Working Group (OFWG), stressed that Vietnam has done a great job in 2017, saying it has been a productive and effective year. “In terms of content, we have addressed agriculture, fishery, aquaculture and other issues such as food security. I am very pleased with the progresses made this week,” he said. There is a tendency in food security discussions to talk mostly about agriculture, and sometimes, fisheries and aquaculture. But actually, fisheries and aquaculture are very important in the region for food security, Patrick Moran said. He suggested Vietnam continue its international cooperation and participate in more international dialogues to gather and share knowledge about food security and climate change. A delegate from New Zealand said Vietnam’s initiatives relating to climate change are very good, commenting on beautiful Can Tho city and great logistics services offered by Vietnam. Suryana Sastradiredja, Minister Counsellor at the Embassy of Indonesia, highlighted Vietnamese people’s hospitality and the country’s excellent organisation of the first, second and third APEC Senior Officials Meetings.